The Metro Clean Energy Resource team recently brought people together from the Minneapolis/St. Paul metro area for its 11th annual event. 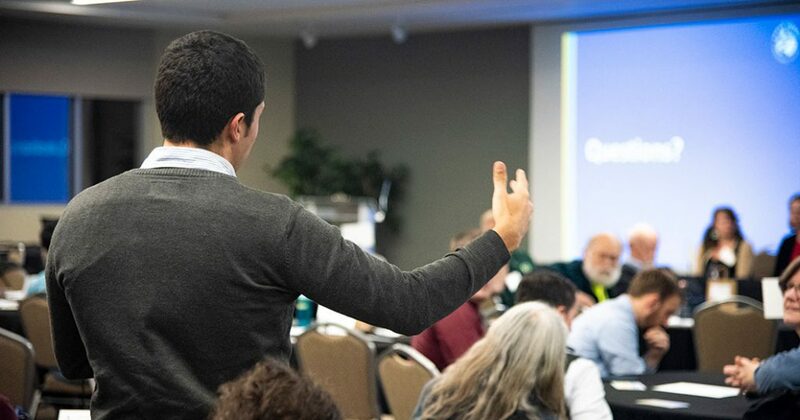 Highlights from the event, which took place in November 2018, include live polling, a panel of lightning talks focusing on clean energy actions in the metro area, and clean energy action postcards that will be sent to attendees. In this blog, we’ll share some of the results of the discussions and resources shared with attendees. After sharing an overview of progress made over the year, the Metro CERT staff warmed up the audience with live polling so everyone could get to know each other a little better. The live polling was especially helpful given that most people were attending their first Metro CERT annual event. The majority of attendees call Minneapolis their home, with other attendees hailing from cities from across the metro. Similar to last year, attendees from nonprofits made up the majority of the audience. Attendees were most passionate about taking action on clean energy in their community, followed by in their work. Electric vehicles were ranked as the top emerging opportunity that attendees were excited that doesn’t get enough attention. Solar, efficiency, and energy storage were highlighted as well. If you’d like to see all the results, you can view them at the end of this blog! We were fortunate enough to have Amy Sparks from A Visual Spark and her incredible talent in live graphic note taking capture the event again this year. Thanks to Amy, you can get a visual overview of the event through her masterpiece below! From electric vehicles to solar bulk buys, the event included a panel of five lightning speakers highlighting opportunities for clean energy actions across the metro. Home Energy Efficiency–Rebecca Olson, Center for Energy and Environment: Rebecca Olson is the director of residential programs at the Center for Energy and Environment and highlighted the Home Energy Squad, a joint program between Xcel Energy and CenterPoint for their customers aimed at providing low-cost ($0-$100) home energy audits and installations. Rebecca identified cities that partner with Home Energy Squad to provide the program at a subsidized rate. Home Energy Squad will install door weather stripping, high-efficiency showerheads, programmable/smart thermostats; run diagnostic tests including infrared imaging; and provide a personalized energy fitness plan–and more! Learn more about Home Energy Squad and schedule a visit on their website. Solar Bulk Buys–Virginia Rutter, Solar United Neighbors and Eric Rehm, Midwest Renewable Energy Association: Virginia Rutter, program director at Solar United Neighbors of Minnesota, and Eric Rehm, solar finance manager at Midwest Renewable Energy Association, gave a joint presentation on solar bulk purchase programs. 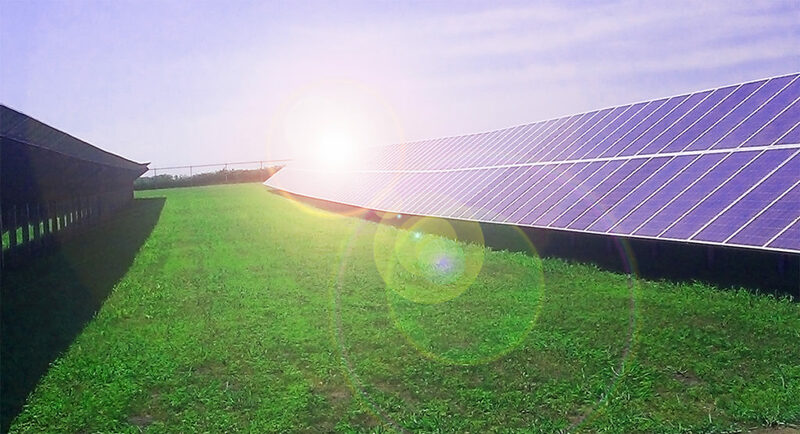 They described the basics and benefits of solar bulk purchase programs, highlighting the similarities and difference in their purchasing programs. Together, they have installed over 286 kW of solar in MN! To learn more, visit https://www.midwestrenew.org/solargroupbuy/ and https://www.solarunitedneighbors.org/minnesota/. Electric Vehicles–Katelyn Bocklund, Great Plains Institute: Katelyn Bocklund, transportation and fuels program assistant at the Great Plains Institute, gave an overview of the different kinds of plug-in electric vehicles, their benefits, and the opportunity to cut emissions in the transportation sector. For more information about electric vehicles in MN, visit org (the Great Plains Institute leads Drive Electric Minnesota). 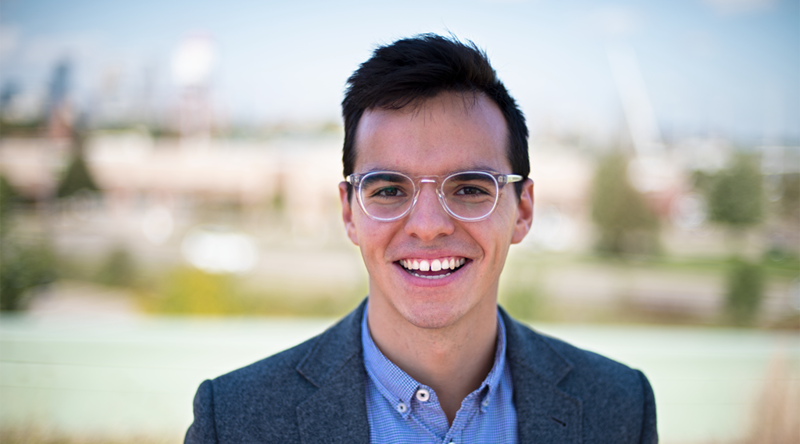 Small Business Energy Efficiency–Matt Kazinka, Lake Street Council: Matt Kazinka serves on the Lake Street Council and co-directs the Twin Cities Small Business Energy Initiative. The goal of the initiative “is to develop new approaches that will lead to more small businesses benefitting from energy efficiency across the metro.” Matt shared how energy coaches can help reduce barriers small businesses face when attempting to become more efficient. 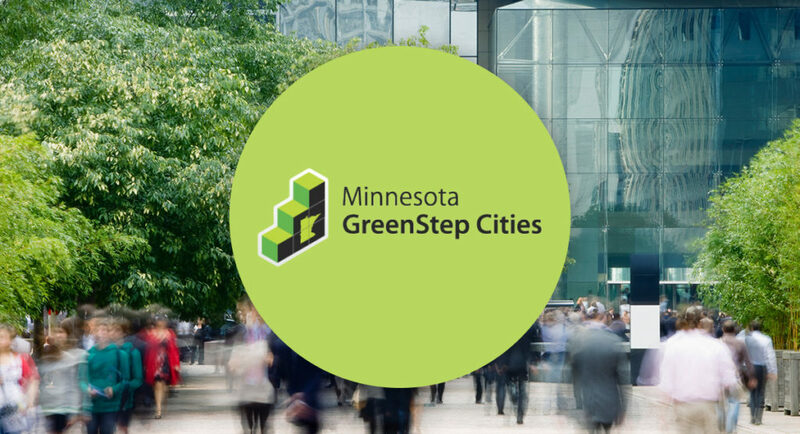 There have been 180 energy assessments on Lake Street since 2014 and Minneapolis’ E-TAP program aims to facilitate at least 150 business assessments and projects by May 2019. Multifamily Energy Efficiency–Emma Ingebretsen, CenterPoint Energy: Emma Ingebretsen, energy efficiency program administrator at CenterPoint Energy, presented on how Xcel Energy and CenterPoint Energy partner to help make multifamily buildings more efficient. Building owners and managers can receive free energy audits, free installations, rebates and incentives, and project support to achieve whole-building energy savings. To learn more about multifamily building efficiency, visit multifamilyenergysolutions.com. This year, attendees were given clean energy action postcards containing an individual and community-level goal related to each of the five lightning talks. Clean energy actions included test driving an electric vehicle, scheduling a Home Energy Squad assessment, engaging a new community for a solar bulk buy, and more! Attendees broke into small groups to discuss which energy actions they would commit to and filled out their postcards with their pledge selections. The postcards will be sent out in mid-January by Metro CERT staff to remind participants of the clean energy actions they committed to. 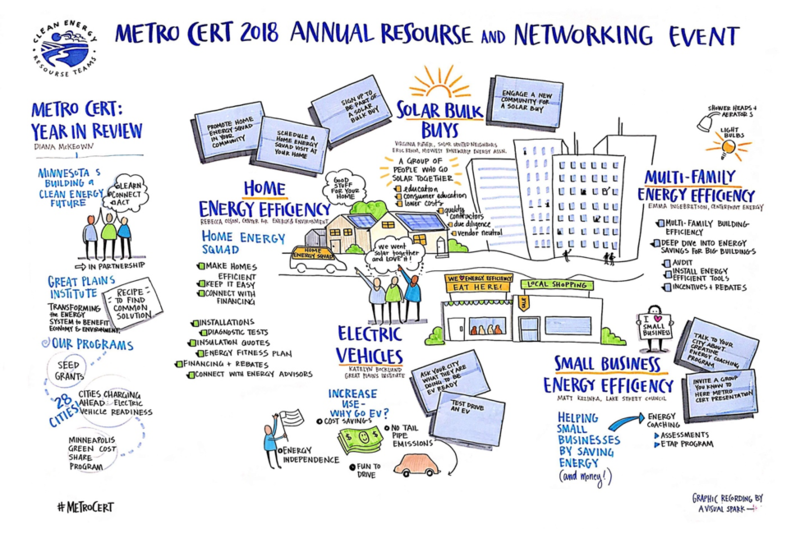 To learn more about Metro CERT and to get the latest news, sign-up for the Metro CERT newsletter. About Metro CERT: The Metro Clean Energy Resource Team (Metro CERT) is coordinated by the Great Plains Institute, a statewide partner of the Clean Energy Resource Teams (CERTS), and serves the 11-county Twin Cities metropolitan area by empowering communities and their members to adopt energy conservation, energy efficiency, and renewable energy technologies and practices for their homes, businesses, and local institutions.